Predecessors to dinosaurs missed the race to fill habitats emptied when nine out of 10 species disappeared during Earth’s largest mass extinction 252 million years ago. That thinking was based on fossil records from sites in South Africa and southwest Russia. It turns out, however, that scientists may have been looking in the wrong places. Newly discovered fossils from 10 million years after the mass extinction reveal a lineage of animals thought to have led to dinosaurs in Tanzania and Zambia. That’s still millions of years before dinosaur relatives were seen in the fossil record elsewhere on Earth. “The fossil record from the Karoo of South Africa, for example, is a good representation of four-legged land animals across southern Pangea before the extinction,” says Christian Sidor, a paleontologist at the University of Washington. Pangea was a landmass in which all the world’s continents were once joined together. Southern Pangea was made up of what is today Africa, South America, Antarctica, Australia and India. Sidor is the lead author of a paper reporting the findings; it appears in this week’s issue of the journal Proceedings of the National Academy of Sciences. 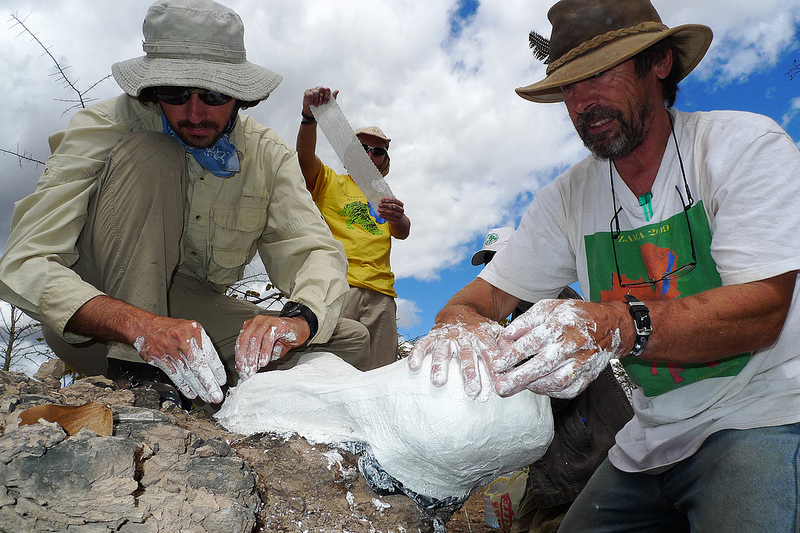 The insights come from seven fossil-hunting expeditions in Tanzania, Zambia and Antarctica funded by the National Science Foundation (NSF). Additional work involved combing through existing fossil collections. “These scientists have identified an outcome of mass extinctions–that species ecologically marginalized before the extinction may be ‘freed up’ to experience evolutionary bursts then dominate after the extinction,” says H. Richard Lane, program director in NSF’s Division of Earth Sciences. The researchers created two “snapshots” of four-legged animals about five million years before, and again about 10 million years after, the extinction 252 million years ago. Prior to the extinction, for example, the pig-sized Dicynodon--said to resemble a fat lizard with a short tail and turtle’s head–was a dominant plant-eating species across southern Pangea. After the mass extinction, Dicynodon disappeared. Related species were so greatly decreased in number that newly emerging herbivores could then compete with them. “Groups that did well before the extinction didn’t necessarily do well afterward,” Sidor says. The snapshot of life 10 million years after the extinction reveals that, among other things, archosaurs roamed in Tanzanian and Zambian basins, but weren’t distributed across southern Pangea as had been the pattern for four-legged animals before the extinction. Archosaurs, whose living relatives are birds and crocodilians, are of interest to scientists because it’s thought that they led to animals like Asilisaurus, a dinosaur-like animal, and Nyasasaurus parringtoni, a dog-sized creature with a five-foot-long tail that could be the earliest dinosaur. “Early archosaurs being found mainly in Tanzania is an example of how fragmented animal communities became after the extinction,” Sidor says. A new framework for analyzing biogeographic patterns from species distributions, developed by paper co-author Daril Vilhena of University of Washington, provided a way to discern the complex recovery. It revealed that before the extinction, 35 percent of four-legged species were found in two or more of the five areas studied. Some species’ ranges stretched 1,600 miles (2,600 kilometers), encompassing the Tanzanian and South African basins. Ten million years after the extinction, there was clear geographic clustering. Just seven percent of species were found in two or more regions. The technique–a new way to statistically consider how connected or isolated species are from each other–could be useful to other paleontologists and to modern-day biogeographers, Sidor says. Beginning in the early 2000s, he and his co-authors conducted expeditions to collect fossils from sites in Tanzania that hadn’t been visited since the 1960s, and in Zambia where there had been little work since the 1980s. Two expeditions to Antarctica provided additional finds, as did efforts to look at museum fossils that had not been fully documented or named. The fossils turned out to hold a treasure trove of information, the scientists say, on life some 250 million years ago. Other co-authors of the paper are Adam Huttenlocker, Brandon Peecook, Sterling Nesbitt and Linda Tsuji from University of Washington; Kenneth Angielczyk of the Field Museum of Natural History in Chicago; Roger Smith of the Iziko South African Museum in Cape Town; and Sébastien Steyer from the National Museum of Natural History in Paris. The project was also funded by the National Geographic Society, Evolving Earth Foundation, the Grainger Foundation, the Field Museum/IDP Inc. African Partners Program, and the National Research Council of South Africa.